The Nokia 500 is a reasonably compact phone at 111.3 x 53.8, as long as the Nokia 700 isn't around. We're talking the same screen size and pretty much the same height and width - but the Nokia 500 is quite a lot chubbier at 14.4 mm of thickness. Good hand fit and all, the Nokia 500 just lacks the elegance and class of its super slim sibling. The rich assortment of colorful back covers gives the Nokia 500 enough youth appeal but other than that, it's actually a conservatively designed phone. It's a touchscreen-bar device of simple styling and low-cost finish, nothing extravagant about it. The curved rear makes it comfortable to hold and the soft rubbery finish is pleasant though probably not very durable. The front is dominated by the 3.2" nHD (360x640) capacitive touchscreen. The resolution is a match for the screen size and the display looks good with pleasingly vibrant colors and enough detail. It's just not as crisp and punchy as a ClearBlack screen. Outdoor performance is average, bordering on poor. With brightness set at maximum it will do on most occasions. Under the display you'll find the two call buttons, the Menu key in between. Just above them, in the display bezel, is the microphone of the Nokia 500. The earpiece is above the display where you also have an ambient light detector and a proximity sensor to disable the display during calls. The right side of the phone features the Lock button, which replaces the lock slider usually found on Symbian handsets. The volume rocker is above it. There's nothing to note on left side of the Nokia 500. The top is where the connectivity ports are. The MicroUSB port is enabled for both charging and data connections. There's a standard Nokia 2mm charging port, as well as a 3.5mm audio jack. The bottom of the device has only a lanyard eyelet. Our test Nokia 500 unit is all black but a collection of exchangeable rear covers will be available in different colors. The back cover wraps around the phone's bottom to create a nice color accent. At the back you see the 5 MP camera lens and the loudspeaker grill. There's no LED flash on the Nokia 500 and no camera key either - a virtual shutter is all there is. A Nokia logo is nicely etched out in the soft rubbery surface of the back cover. A 1110 mAh Li-Ion battery powers the handset, with the SIM compartment and microSD card slot under it. The Nokia 500 is quoted at up to 500h of 2G standby and 455h in 3G. Talk times are 7h and 5h respectively. 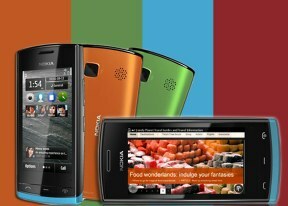 The Nokia 500 feels comfortable in the hand and is not a hassle to carry around. It's a simple design free of embellishments and we don't mind the plastic finish. Exchangeable back covers are the only design feature to note in this entry-level package.